I've been unable to get into blogger for awhile. But, I haven't had anything earth shattering to write about anyway, so I suppose it's no great loss. I'm guessing you're not sitting by your computer waiting for my blog posts to pop up anyway. The year is off to a busy start. I've got three freelance articles due in the next couple of weeks, and a new social media client. That's all good news. If I could just find a few more hours in every day that would be incredibly helpful. Work is also fun right now because I'm planning a neat event for the opening of a Snoopy exhibit on February 12. I've been doing some after-Christmas shopping. You probably know I'm being very frugal these days, but I so so so so so love after-Christmas shopping. I set aside a sum of money to "play" with in that regard. Not as much as I usually have, but enough to enjoy. Everyone cares about different things when it comes to money and this is something that gives me a tremendous amount of joy. I need more joy in my life - if it comes in the form of glitter-covered ornaments or nice perfume or great stationery. Some people care about designer clothes and some about fancy cars. I'd rather buy my clothes on clearance and be able to have Christmas ornaments. I realize that makes sense to very few people. After all, one of those things is a daily need and one a yearly desire. And it's not as if I'm lacking in Christmas ornaments. I have thousands. But, nonetheless, it's what makes me happy. One of my mother's greatest gifts to me was teaching me to be happy. Talk about something that's a daily thing - that's it. Being happy. We now know that people have a "set point" of happiness but it accounts for only about half of their happiness level. People can, indeed, choose their happiness level. The trick is that for some people happiness is natural and for others it's a learned behavior. I don't know which it is for me, but my mother was insistent that I should do the things that made me happy as long as they weren't hurting anyone else. That is excellent training for life. And part of the reason I own a few hundred more Christmas ornaments today than I did a week ago. It doesn't hurt anyone for me to have ornaments, and I'd rather give up something else. All of life is about choices, it seems. 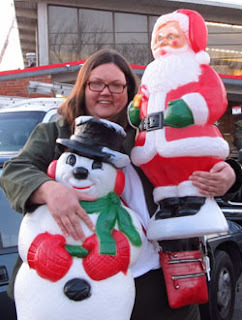 I decided to give up other delights to have a snowman, Santa, and pretty, sparkly things. It's not the choice I would urge for everyone, and I will have to turn down other fun for this, but it's a good choice for me.